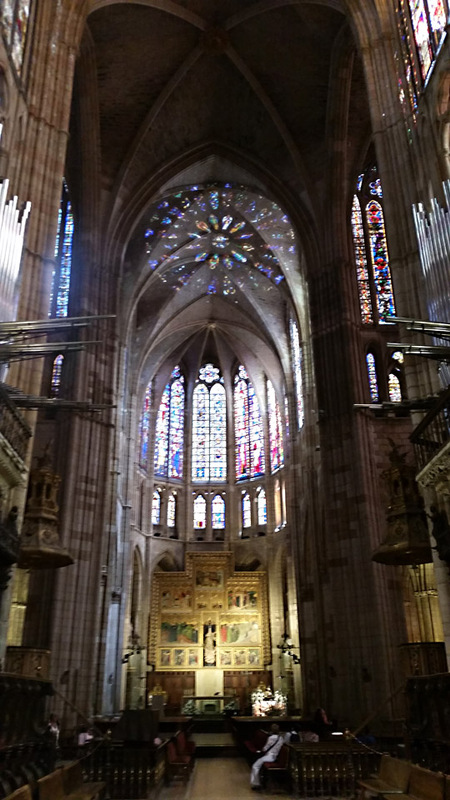 This entry was posted in Beauty, Camino, Church Architecture, Faith and tagged ad orientem, Camino, Cathedral, Christ, Leon, light on September 15, 2014 by frjfkauffmann. The cathedral at Leon is an artistic jewel that captivated my imagination because of the play of light through the beautiful stained glass that brings one close to the celestial Jerusalem. The construction of this magnificent cathedral is also a symbol of the flourishing of a new urban culture after the European crisis of the feudal period. With the development of a middle class, cities grew and contributed to a luminous culture full of vitality. After the collapse of Muslim power in 1212, King Alfonso promoted science and the arts which made his court a cultural center. This is truly an example of Spanish exceptionalism. Oftentimes we think of the 13th century as a time of darkness and superstition but it was a time of a cultural fullness that far exceeds modern culture, in that in the 13th century the Catholic faith brought forth beauty in over 200 cathedrals in Europe. That is true exceptionalism! The simplicity, elegance and purity of lines of this cathedral lifts the spirit to the heights and brings to earth the divine world and thus brings us to heaven during the sacred liturgy. Spending hours in the cathedral helped me come to a profound understanding of how exceptional the 13th century was in the history of western culture. I was filled with wonder and awe as I explored this artistic jewel. This entry was posted in Beauty, Camino, Church Architecture, History and tagged Alfonso, archite, Camino, Cathedral, Leon, Spain on September 11, 2014 by frjfkauffmann. Burgos Cathedral – Wikipedia Entry. 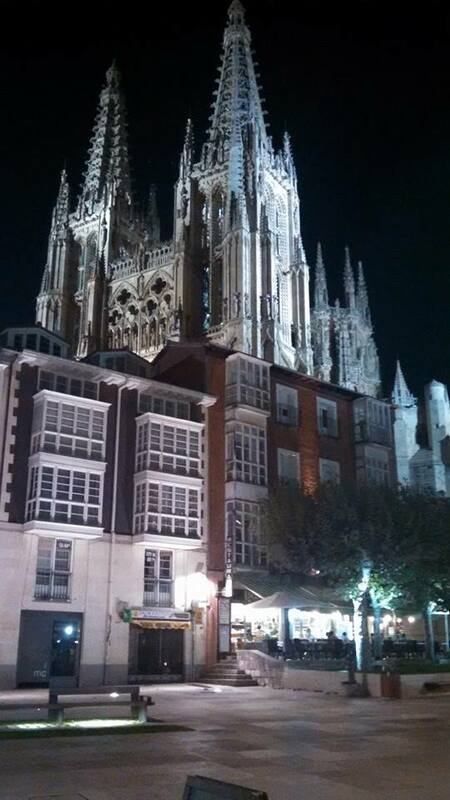 Burgos Cathedral is the burial place of El Cid. (Click images for larger versions). This entry was posted in Camino, Church Architecture and tagged Burgos, Camino, Cathedral, Church Architecture, El Cid, Spain on September 5, 2014 by frjfkauffmann. We prayed Morning Prayer on a medieval bridge in Larrasoaña. We had a rest with other pilgrims at Zuriain and befriended Andrew and he walked with us the rest of the day. We stopped in Trinidad and said a prayer at the 13th century Church of the Holy Trinity. 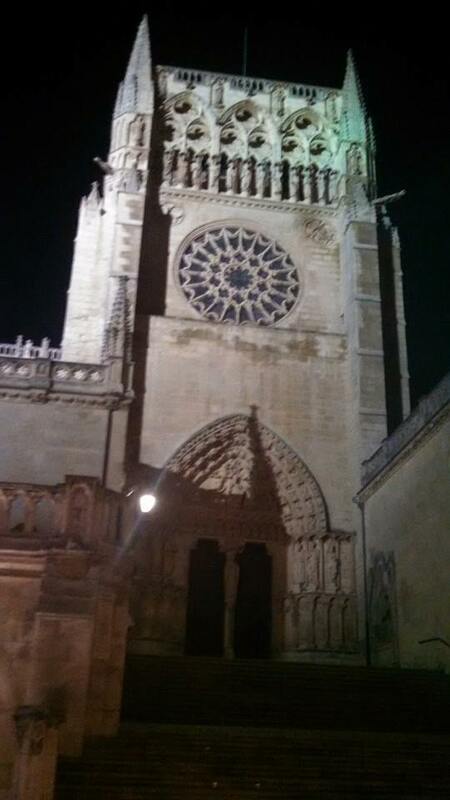 This entry was posted in Camino, Pilgrimage and tagged Camino, Cathedral, Spain on August 28, 2014 by frjfkauffmann.